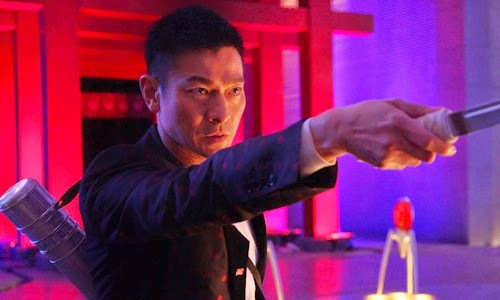 A Chinese take on the James Bond super-spy formula, starring Infernal Affairs' Andy Lau, sounds pretty groovy, right? Let's sweeten the deal with the lavish landscape of Dubai captured in vibrant cinematography, along with an against-the-clock rush to obtain two halves of a crucial historical painting and an array of high-tech gadgetry aiding the hero. Everything about freshman director Jay Sun's Switch sounds promising, striking while the iron's still hot from the surge of films from the revamped Bond universe. That's why it's so ... confusing, I guess, to see the absolute mess of candy-coated tedium that fizzles out on-screen, where even Andy Lau's tense glances and charisma can't even come close to saving it. Instead, Switch turns into the kind of movie that makes one appreciate other, similar misfires of the espionage genre just a bit more, simply because they can string together a remotely legible plot and sustain some kind of pacing while switching from scene to scene. Director Jay Sun also penned the script, a baffling collage of tropes and cliches built around an incredibly straightforward concept: a spy, Xiao Jinhan (Andy Lau), sets out to stop crime organizations, namely the Japanese yakuza and British profiteers, from obtaining a highly significant MacGuffin painting, "Dwelling in the Fuchun Mountains". There's a bizarre and brutal villain leading one of them, Yamamoto (Tong Dawei), pulling the strings behind covert attempts to locate one-half of the work, while agent Jinhan's marriage to Lin Yuyan (Zhang Jingchu, Jade Warrior) continues to fall apart as he keeps his work -- and his associations with other female partners, primarily Lisa (Lin Chiling, Red Cliff) -- secretive. From there, Switch haphazardly tosses in double-crosses, faked deaths, and hokey, orchestrated death traps that liberally borrow from its inspirations, while jumping between locations in China and Dubai for the obvious purpose of making the film's locations more exotic in hopes of sprucing up the story. Frustration sets in very, very early with Switch, though, namely because director Jay Sun can't figure out how to seamlessly coordinate the location-hopping of a spy thriller with product placement, lending itself to ungainly jumps between scenes that cripple the film's pace. "Scenic" shots of colorful hotels, clubs, and other venues make it feel more like marketing materials from the Dubai Department of Tourism instead of, y'know, a focused motion picture, continuously flashing its sponsorship from Nokia and Audi in ways that make the publicized branding in the Iron Man franchise and Fringe look almost subtle in comparison. Part of that simply boils down to editing, where transitions between -- and within -- sequences often land on another novel use of a phone or a different model of Audi at agent Jinhan's disposal. The other part, of course, lies in the disjointed nature of the story itself, whose nonsensical plot leaves one admiring the gadgetry and the waaay overdone set design out of boredom. Strangely, down to the clearly-branded cars zipping around and the touristy shots of Asian locales, it's probably more rewarding to look at Switch as a humorless parody of the spy genre instead of as a sincere replica. Things just kinda happen in Jay Sun's script for the sake of shock value and crossing off genre tropes -- lopped-off fingers, inexplicably trained warrior women on rollerblades, kidnapped children, even a random fencing match -- with little justification or maturity, only a nudge and a wink away from humor. Even the cartoonish villain recites an eyeroll-worthy "death is too quick" speech from behind a piano bathed in luxurious blue lighting. The only thing worth taking seriously is Andy Lau's performance: he delivers the sharpness and cheeky charm of a covert agent as much as he can with the dialogue he's given, showing little sign of age or loss of edge since the Infernal Affairs trilogy. It's unfortunate to see him work around the absurd chauvinism of Xiao Jinhan's cover and the flirtatious banter with a female partner over a earpiece, because 007 the character ain't. When Switch isn't getting lost in the dead-end maze of an inept plot, it does try to muster some energy in brusque hand-to-hand sequences, high-speed chases, and gunfights within the meticulously-composed and vividly colorful environments. For fleeting moments, like the crash of a hurled body during a fierce brawl and the slow-motion trajectory of a sniper bullet, there are flashes of simple vigor and moderation that Jay Sun's direction ultimately needed. Alas, they're brief interruptions in a brainless blur of phantom bullets and metallic scroll tubes changing hands, awkwardly stumbling through action sequences as it leads towards an ending that figures, hey, why not throw in katana-dueling women, twirling fireballs, and prosthetic masks to finish this thing off? And it does so with a straight face, somehow, laced with enough tragic melodrama to sap the conclusion of any "so bad it's amusing" entertainment value that it might generate. It makes one think that Jay Sun should have considered stirring together a blend of simple genre elements instead of shaking 'em all together and pouring ... this out.